This is our second recorded MN Mixte. It is Major at the top of his game in every sense and must have been for a very special lady rider. It is the only example of a fillet brazed Mixte frame we have seen or heard about. Fillet brazing took more time and far more skill than lugs. The topeyes are perfection as is the double fishtail motif in white in his 80’s more central cross stroke style. This is a masterpiece of the simple elegance he often achieved; in this case topped out by the simple band of the seat clamp and the simple flat top fork crown I have never seen before. The Mixte is at its most elegant in a single colour using only world champion bands to form panels for head and seat tube crests and white with black edge downtube Gothic Script transfers. Seat pegs and shifter bosses. Reynolds 531 transfer. Nicely fitted out too. This would be in my top ten I think. Only one concern is that the gear side dropout looks to have been opened a little. ‘My wife and I bought it from the original lady owner in Birmingham in 1984. It had 26 inch large flange quick release Normandy hub wheels, which I replaced with some faster Miche hubs + 700c mavic rims. 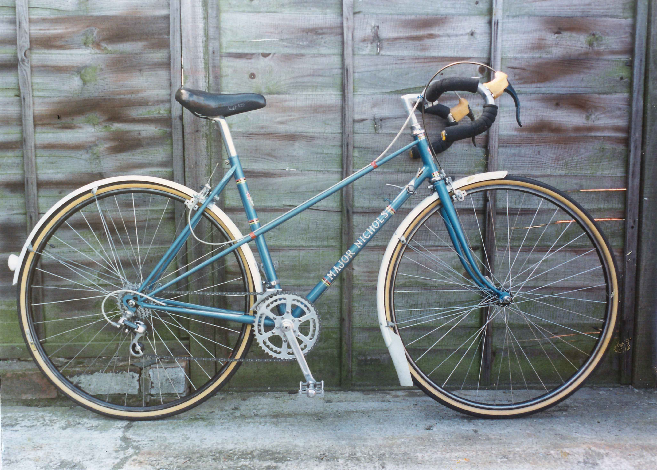 It had a TA double chainset and the Reynolds 531 frame tubing was finished in a metallic turquoise and was in excellent condition. The graphics were white, with lovely long spear point seat stays and lug lining. I sold the bike in 1991 probably through cycling weekly to someone from Yorkshire, sorry no record of sale or bb number. 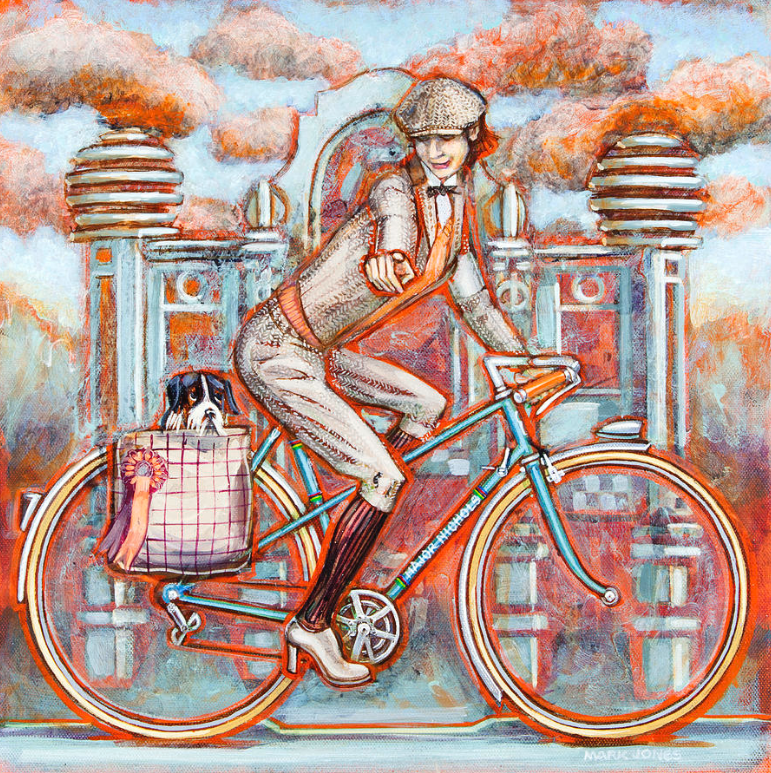 I painted a copy of the bike in the Tweed Runner and Major Nichols. My first bike portrait was a maroon Major Nichols track bike. This led to commissions for Harry Quinn and Hetchins bikes. There are over 100 acrylic on canvas paintings related to cycling on my website, and I intend recording a number of famous British marques. (See For Sale page).